Landis+Gyr has partnered with Generis Technology to provide the most advanced electricity and gas prepayment functionality together with a state-of-the-art data acquisition infrastructure and remote meter management capabilities. Landis+Gyr’s open architecture allows for the seamless integration of meter types from other vendors with many meter types already supported. The back office AMM system supports full two-way meter communication to facilitate accurate and timely data acquisition as well as remote control of metering functions. This includes support for change of tenancy, change of supplier, updates to customer tariffs, retrieval of customer reads and remote disable / re-enable of supply for both gas and electricity. 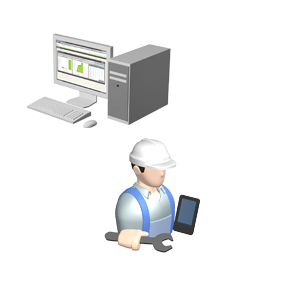 The Utility is in full control of the meters in the field with the ability to perform scheduled reads of meter data for Gas and Electricity meters, together with the capability to update, configure and manage the meters remotely. This brings benefits to the Utility including accurate billing, load profiling and reduced site visits.The AMM system can be easily integrated into the Utility’s existing software architecture using a number of different integration techniques, including support for existing UK industry flow formats.The prepayment functionality allows the consumer to purchase credit via multiple payment channels, including point-of-sale, mobile phone or web. Once a purchase has been made the AMM System will send the credit value to the meter via an SMS message. This tokenless method of payment transfer makes the Landis+Gyr Fuel solution the leading system in today’s energy market. Integrated with Generis B-Smart application suite for support of existing and smart data flows. Leverages benefits of a Tokenless Smart Prepayment Meter with support of multiple payment channels. Přihlaste se k odběru našeho bulletinu, abychom vám zasílali produktové informace, e-časopisy a další materiály — automaticky do vaší e-mailové schránky.